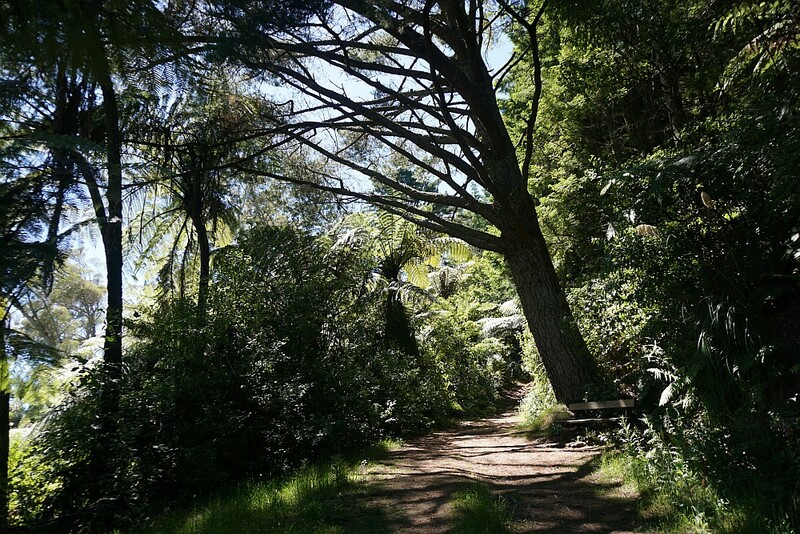 Tokorangi Pa Track is the longest of the three longer walking tracks through the Whakarewarewa Forest. 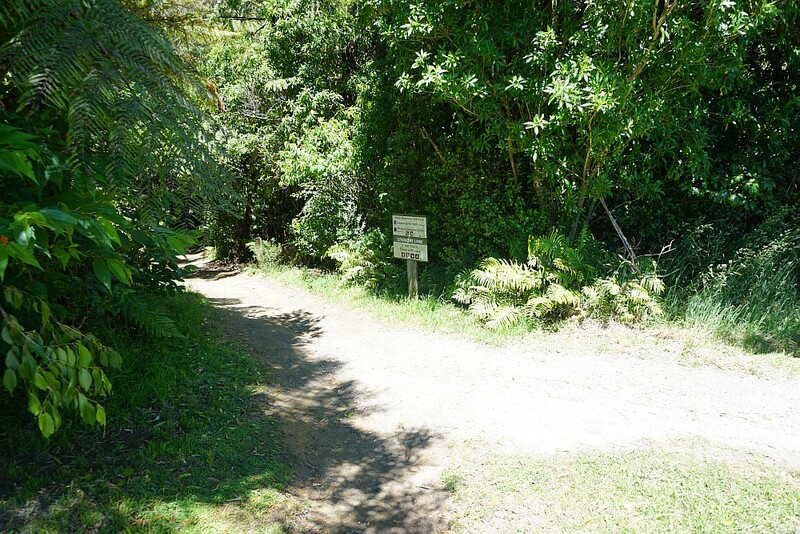 As with the other two, the Pohaturoa Track and the Quarry Track, it starts and ends at the information centre on Long Mile Road, off Tarawera Road. The start of the tracks is covered in the posts with those two tracks, and information about the tracks can be found on the Redwoods site. The track has a posted length of 11.5 km, with an estimated time of 3 hours 30 minutes to complete the walk. 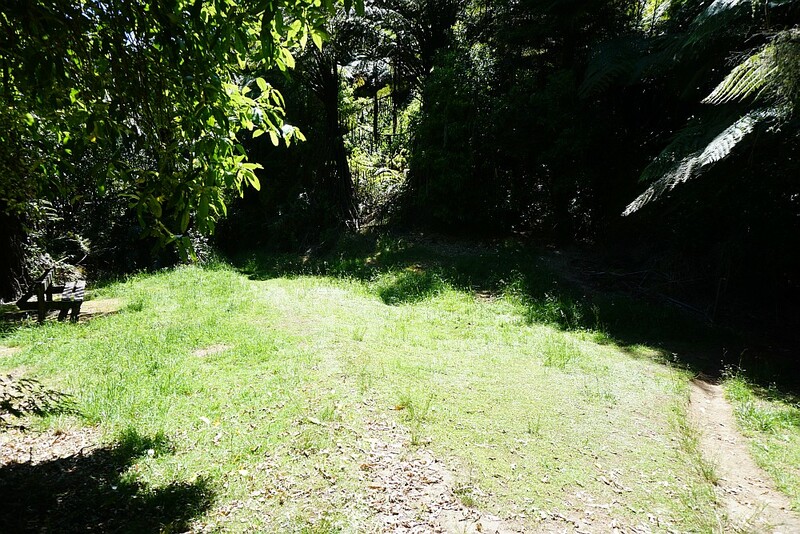 It passes through various forest areas, with several different varieties of trees, but there is no obvious sign of the actual Tokorangi Pa site along the track. A significant part of the track does not have any or only partial shade from trees. The track consists of a loop, marked for walking in a clockwise direction. The sign at the track start next to the information centre. The map of walking tracks found at various locations, both at the start of the walk, and a couple of places alongside the track. 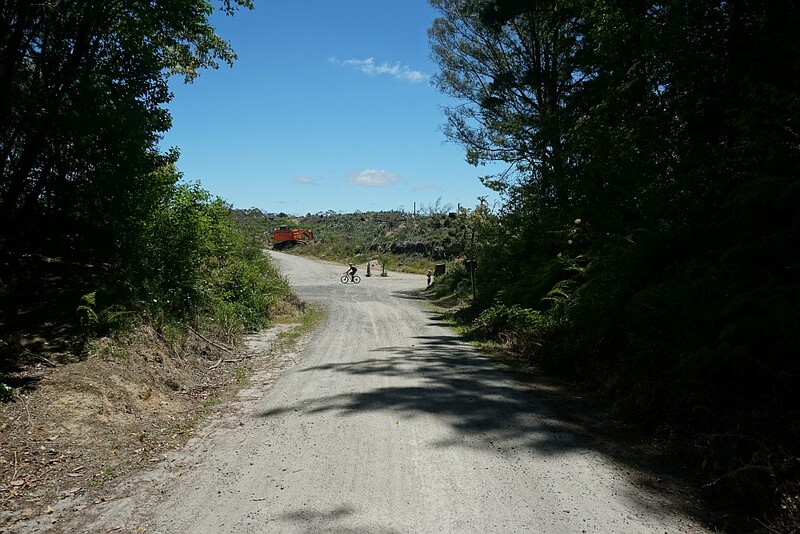 After turning off from the Pohaturoa Track, the Tokorangi Pa Track follows the Quarry Track up the hill almost to the ridgeline. The track branches off to the right to join up with Tokorangi Pa Rd. 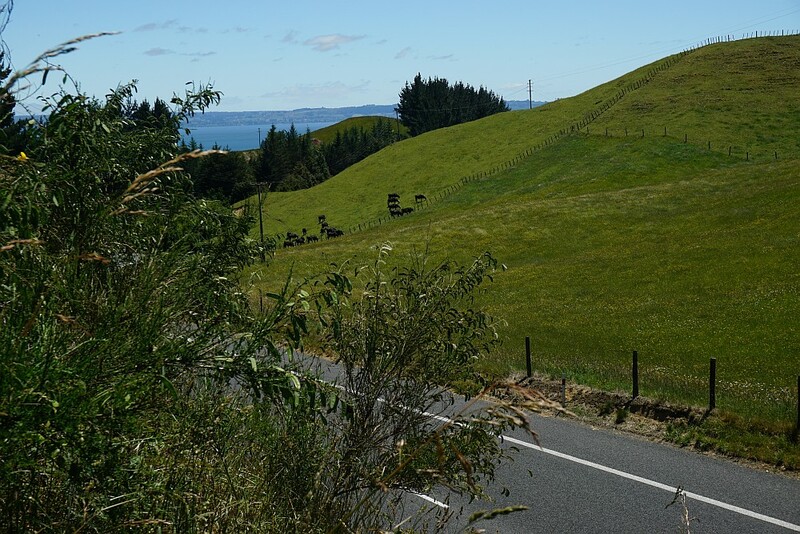 Tokorangi Pa Rd is a forestry road, wide enough for a vehicle. It is shared, with walkers, horse riders, and mountain bikers all using it. The walk continues along the road to the left. 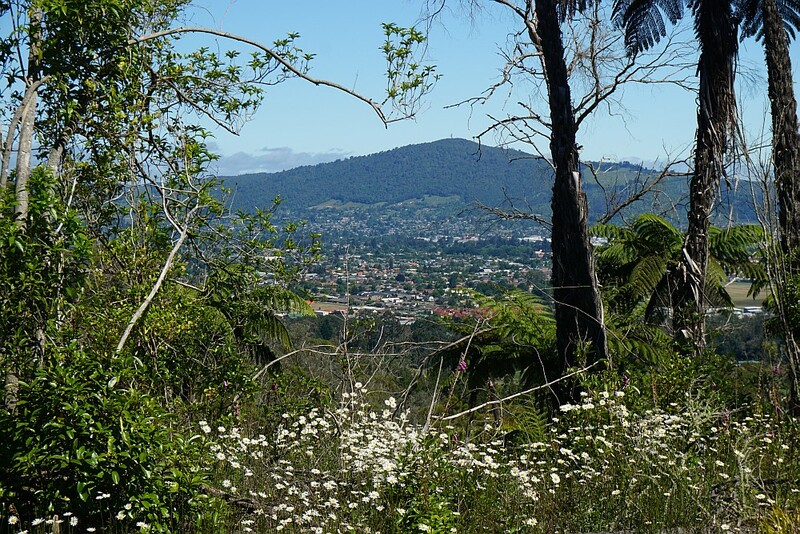 In various locations it’s possible to get views over Rotorua and Lake Rotorua. Here looking towards Mt Ngongotaha. And looking towards Lake Rotorua, with Mokoia Island. 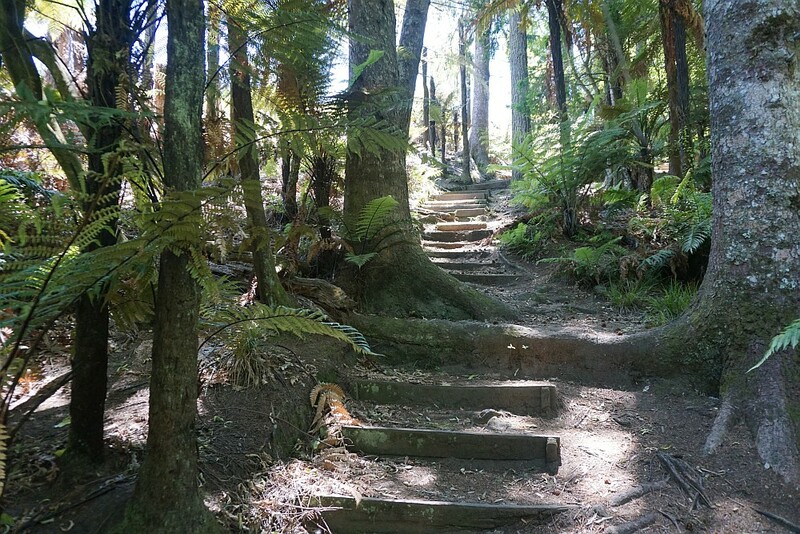 The walking track only follows the road for a short distance before continuing through tree cover, on a track which runs roughly parallel with the road. Tokorangi Pa Track is not as well marked as the other two tracks, and occasionally it’s not obvious which track to follow. 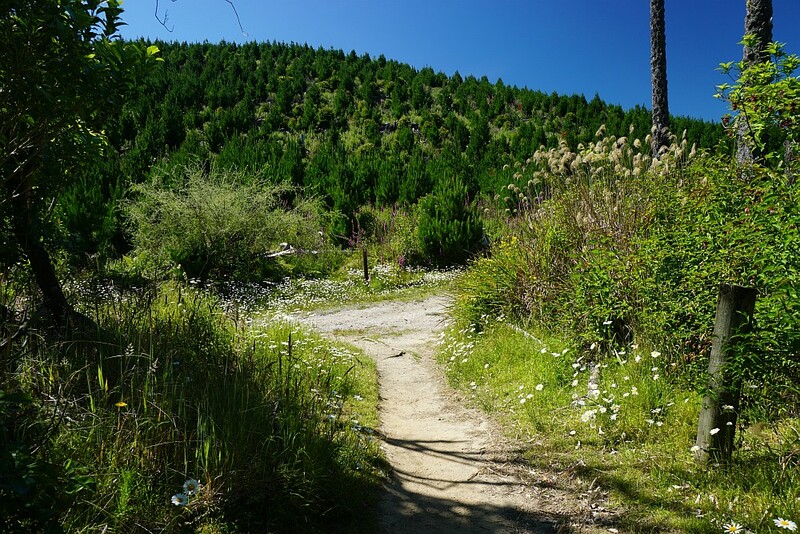 Here a mountain bike track crosses over the walking track. 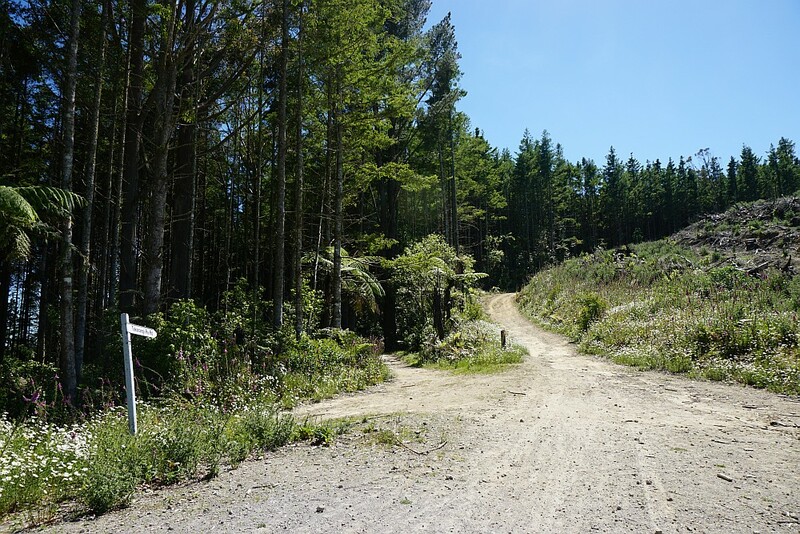 The walking track emerges onto Tokorangi Pa Rd again, just across from a skid site down a short road, used during recent forest operations. 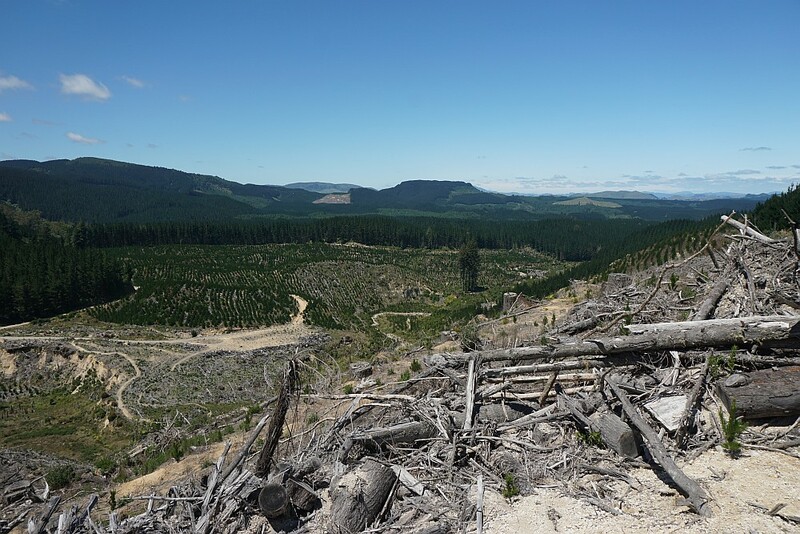 The skid site provides the only views to the south across the Whakarewarewa Forest. At least until the recently planted pine trees start growing and blocking the view. The tracks that can be seen on the left in the near distance make up part of Tokorangi Pa Track. The track exit across from the skid site is on the left. 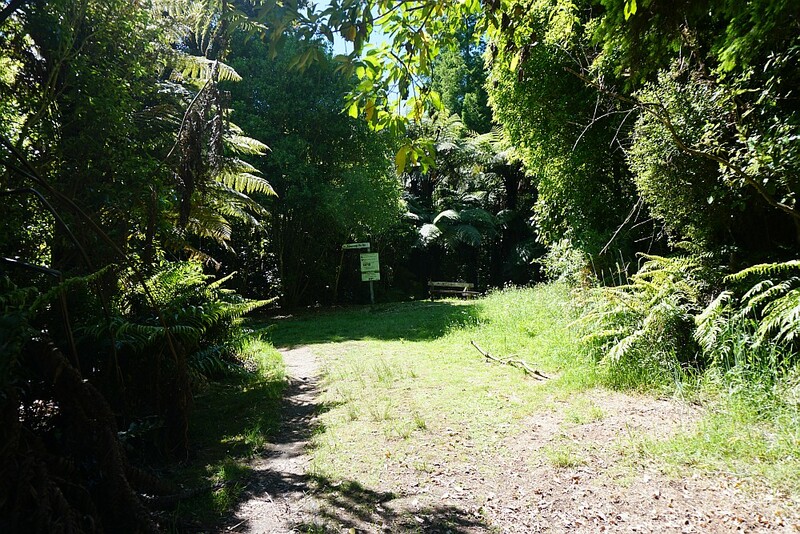 The walking track is the track at the centre, heading into the trees. The track curving around to the right is a horse riding track, which meets up again with the walking track. It could be used as a shortcut walking track if desired. 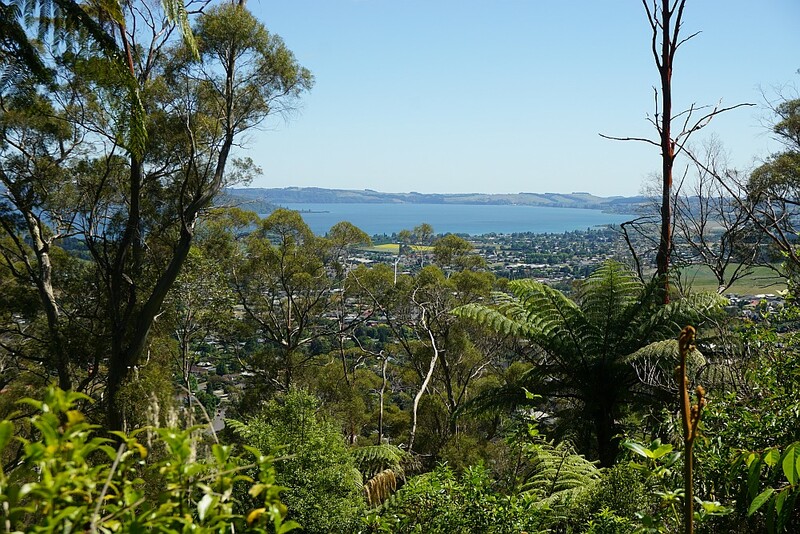 Views to Lake Rotorua from the walking track. A suitable location for a short rest, on a bench seat, under a large pine tree. Near the highest point on the track. The walking track meets up again with the horse track (Tokorangi Pa Rd). The sign pointing up the horse track says it leads to Tokorangi Pa Lookout. However, following the horse track back to the skid site provided no better lookout than the one at the skid site. 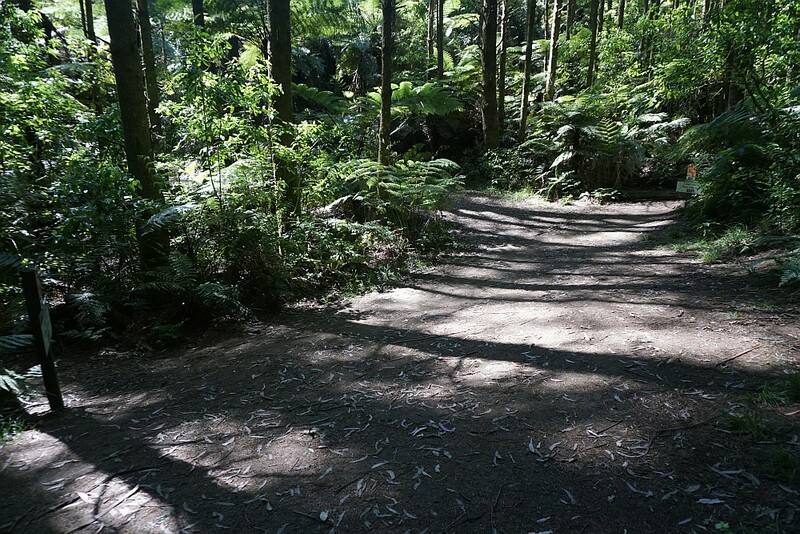 The walking track (on Tokorangi Pa Rd) continues downhill to the left. A small clearing. An overgrown Tokorangi Pa Rd continues straight ahead. The walking track continues downhill into the shadows on the right. The track continues on to the town water supply tank next to Tarawera Rd. 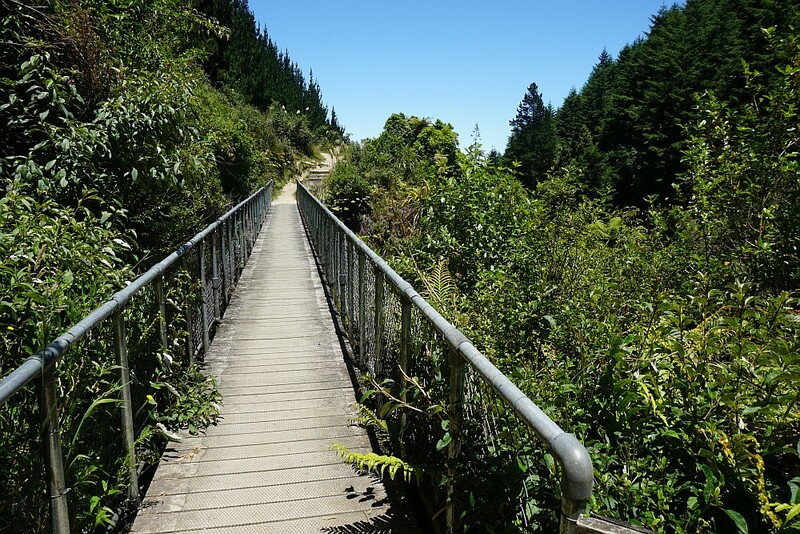 From here it is possible to follow the link track through the redwoods parallel to Tarawera Rd back down towards Long Mile Rd and the information centre. 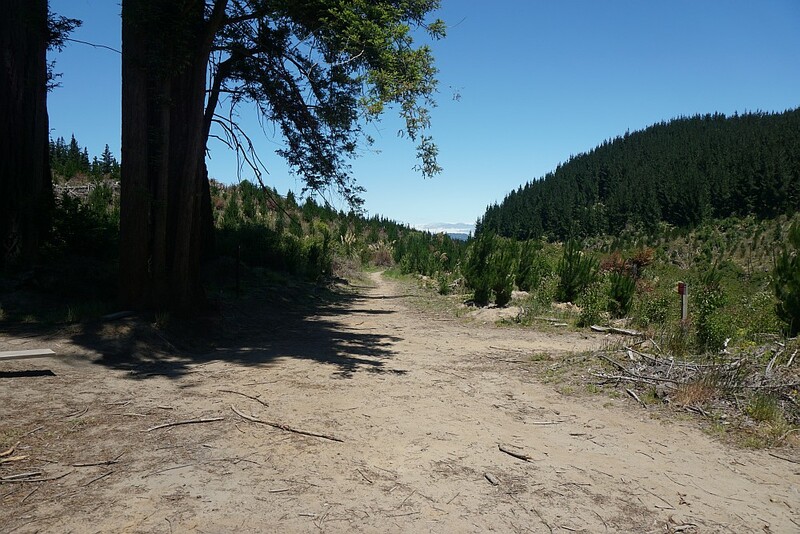 There is a small parking area on Tarawera Rd near the water tank, from where the track can also be accessed. 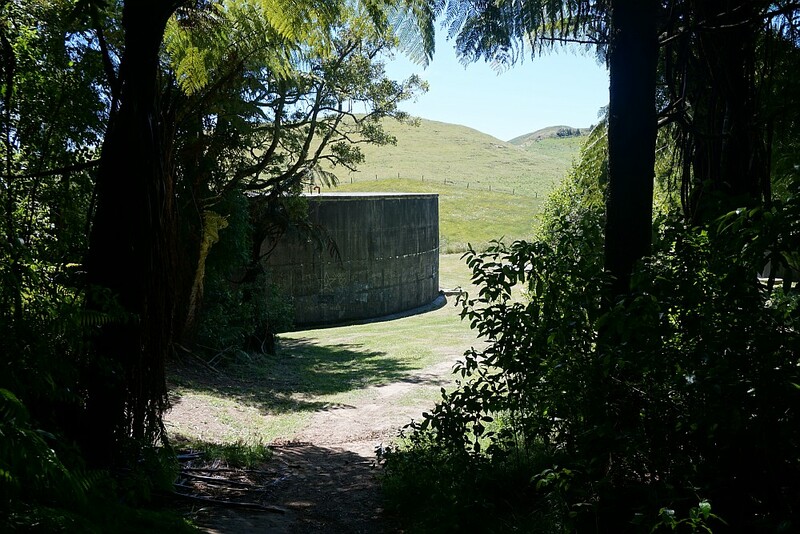 Tarawera Rd is only a few metres from the water tank. Lake Rotorua is visible from here. Tokorangi Pa Track continues downhill in a southerly direction, following Pipeline Rd for some distance. 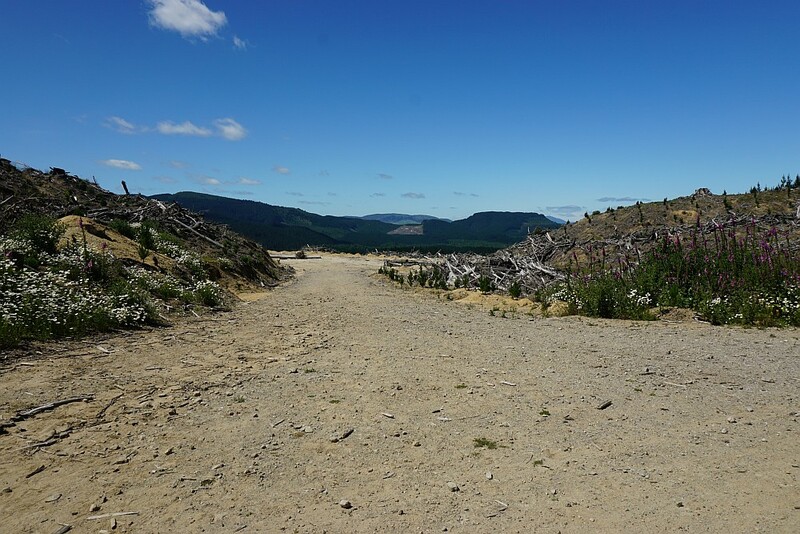 Following the pipeline for the Rotorua water supply. Pipeline Rd continues down through a valley. The walking track branches off from Pipeline Rd, continuing parallel to it, but lower in the valley. Here the view back up the recently logged hillside with the skid site by the grove of eucalyptus trees at upper centre of the photo. Note the mountain bike track which zig-zags it’s way down the steep hillside. 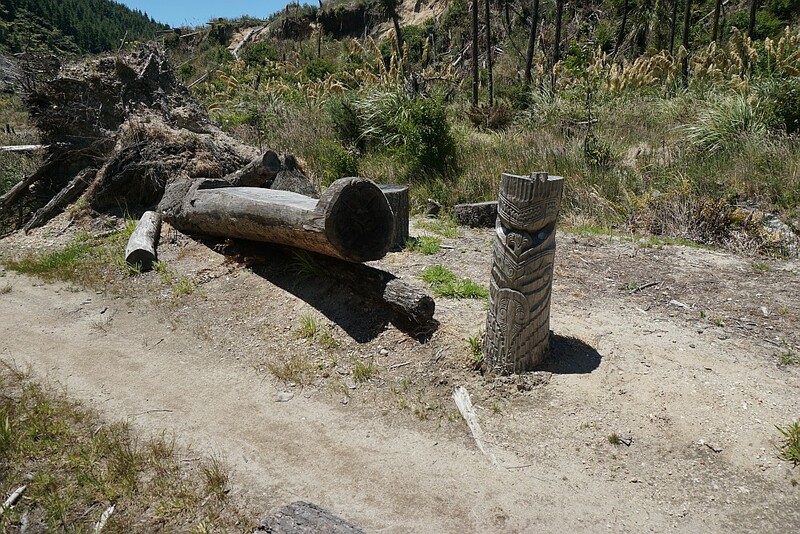 Some forestry workers have presumably had some spare time, carving a log. There is also a carving on the end of the log formed as a bench seat. There are numerous other bench seats made from raw logs along this part of the track. 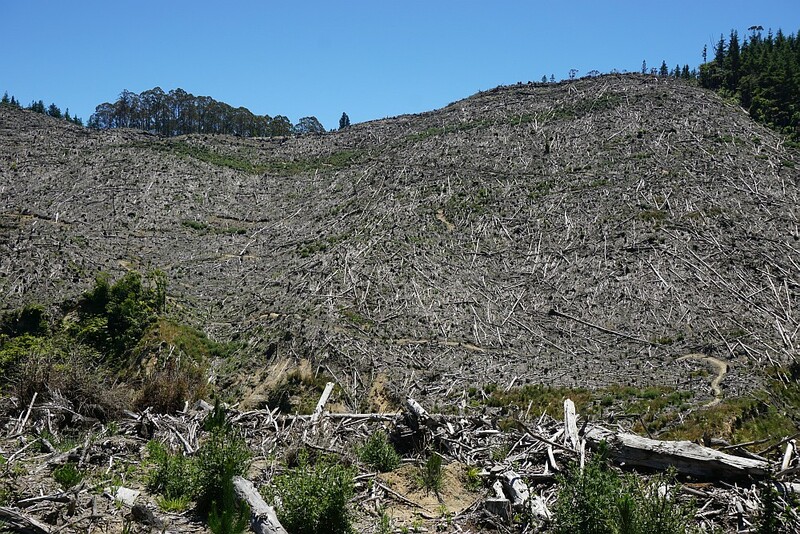 A small stand of tall redwood trees have been left standing. The walking track continues straight ahead. Shortly afterwards it branches off to the left and heads up a hillside through a stand of trees. It’s not a long climb, but there are numerous steps on this part of the track. 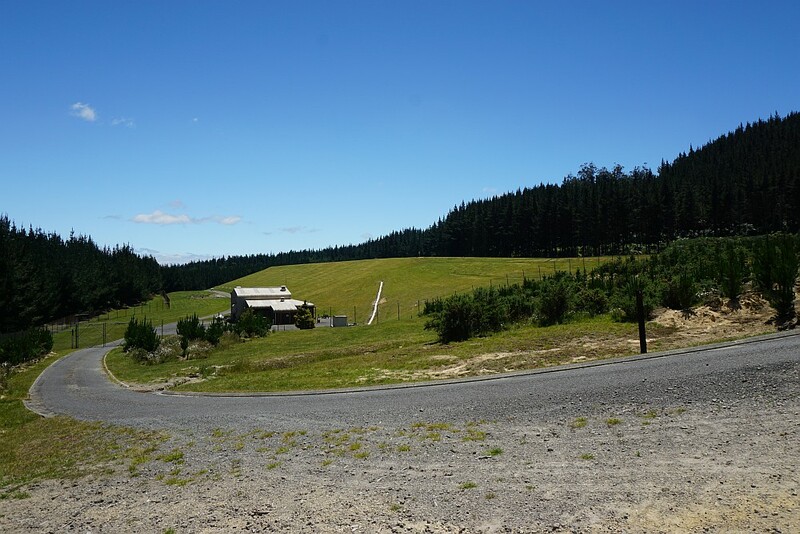 The track emerges from the forest at the effluent treatment plant within the Whakarewarewa Forest. 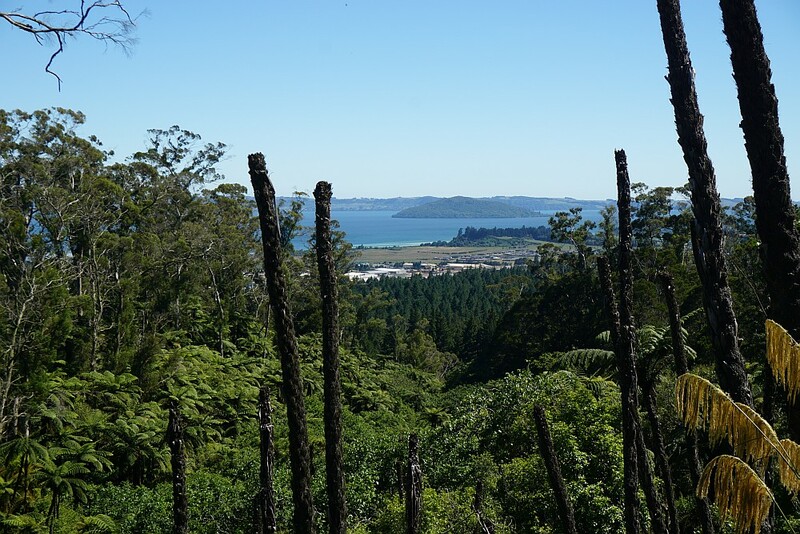 The water with nutrients is used within the forest area to reduce the pollutants in Lake Rotorua. 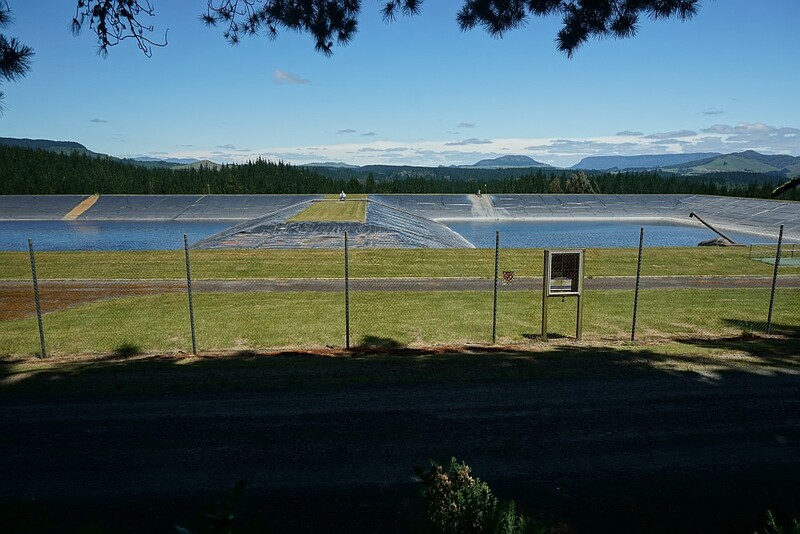 The two ponds at the treatment plant. There was no smell from the ponds, and ducks were swimming in the pond to the right. 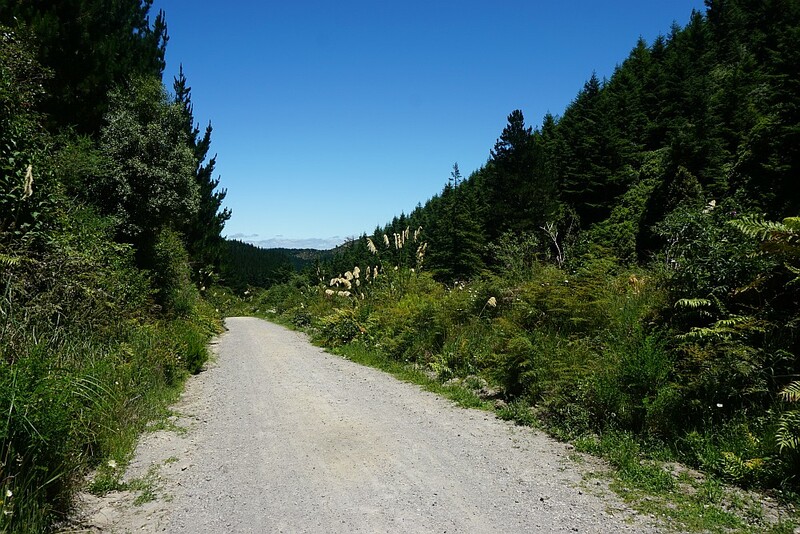 The track or road continues through trees before joining up with Nursery Rd, and the return leg of the Pohaturoa Track. The mountain biker is on Nursery Rd, with Radio Hut Rd behind the rider. Tokorangi Pa Track continues with a right turn onto Nursery Rd. 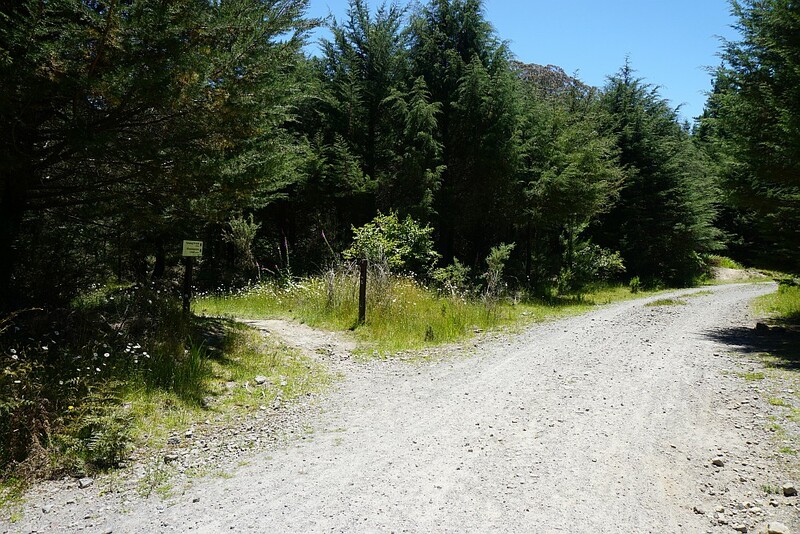 It follows Nursery Rd down to the redwoods and back to the information centre. 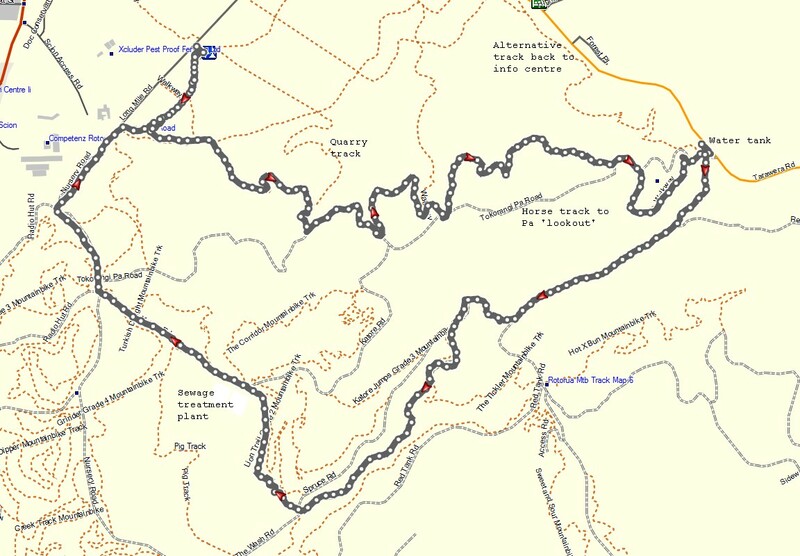 The GPS tracklog shows the route followed, with the loop walked in a clockwise direction. The total distance was measured as 11.2 km, with a walking time of 3 hours. This does not include the time and distance spent looking for a lookout on the horse track. From the information centre to the water tank by Tarawera Rd was a distance of 5.1 km, and took 1 hour 25 minutes. 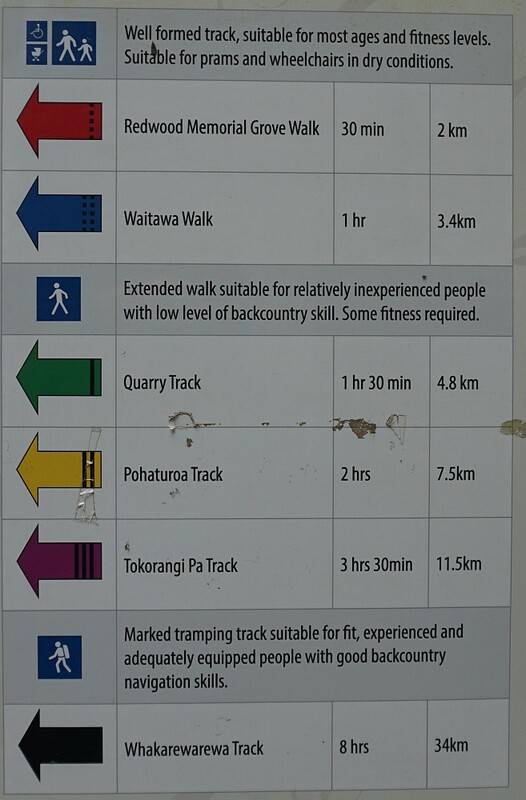 From the water tank and back to the information centre, following the Tokorangi Pa Track, was a distance of 6.1 km, and took 1 hour 35 minutes. Lowest elevation is about 300m above sea level, highest about 525m asl. 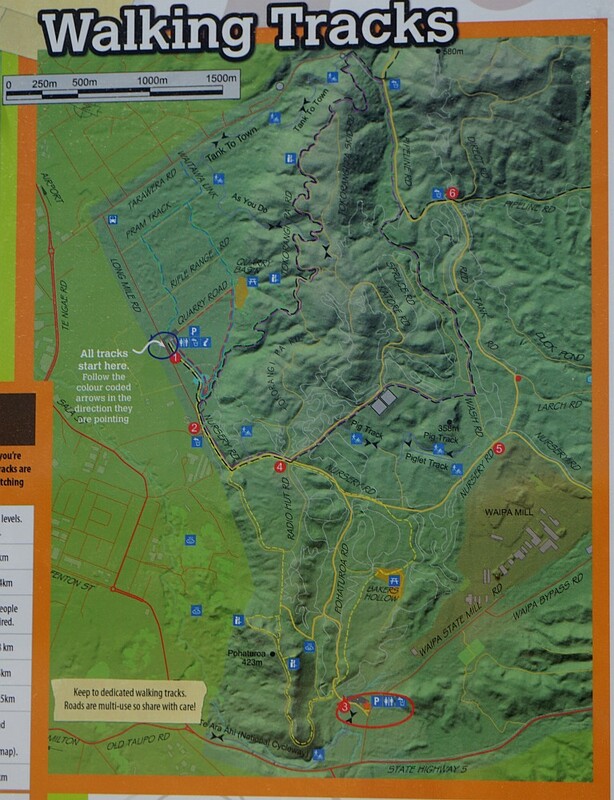 A topographic map and satellite image of the area can be found on the Pohaturoa Track post. The track was walked on December 22, 2015. 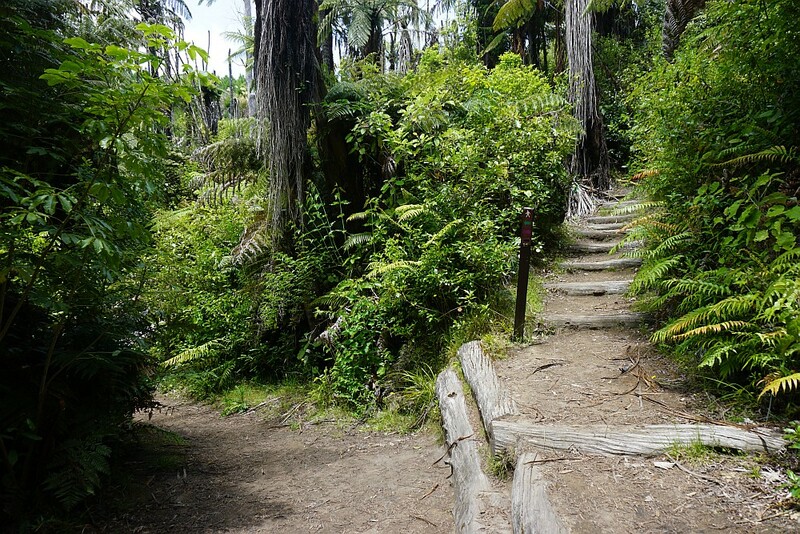 This entry was posted in Walks and tagged Rotorua, The Redwoods, Tokorangi Pa, Whakarewarewa Forest on 2015-12-22 by nzartig.